I'm still sick (but definitely on the mend and getting better each day). With my asthma, colds just tend to hit me harder than other people (M was over this one in two days, we never even noticed Remy being sick). And my lungs are especially overworked right now because of all the (beautiful) pollen. It's an irony I've long appreciated: my favorite time of year is also the most difficult, for my lungs. With the cold, it's really just been the 3 years in my late twenties we lived in Toronto and now these past 4 winters in New Jersey that I've ever had to consistently deal with cold/snow. That's only seven winters out of 39 I've experienced in my life! I have the built in expectation that the world around me wonn't get so cold. Won't be so snowy. Dropping that expectation is difficult. Especially since the expectation leads to "shoulds" (I shouldn't be so cold, I shouldn't have to deal with so much snow). It's an ongoing challenge. This year was particularly rough. It snowed again last night. Just a bit, but enough that when I walked over to get Remy early, there were still light patches in the shadows. Ah. Snow. There's enough color all around now that I can ignore it, instead of letting it annoy me. Spring is here. 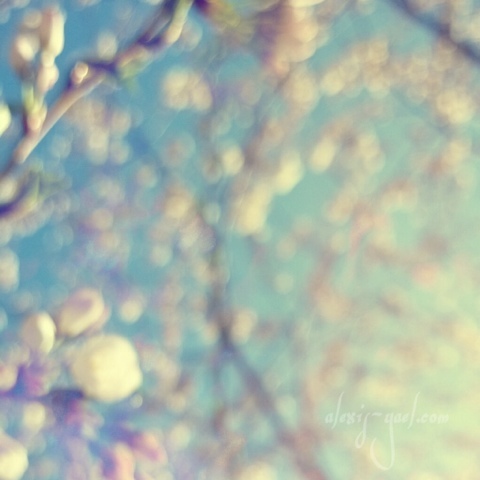 My only expectation is that the world will bloom around me, despite cold snaps. Remy came home early because his class is watching an afternoon movie - today was our last made up snow day, so spring break starts tomorrow - and his phobia about new movies is still in effect. Instead of making the rest of his class watch something that was ok for him, I asked if he just wanted to come home instead and he said yes. He'd rather just not watch anything, really. Even movies he's seen. It's just not his thing. So he's home and happily legoing/arting/playing. He said "I can't wait to tell everyone what fun we had at home together!" We were going to have an especially fun spring break, but then the first three days got cancelled and now I'm sick, so who knows what will happen. I don't have any expectation and luckily, Remy doesn't either, since this is maybe the first time I've ever been sick that he seems to understand that I'm sick and what that means - like, maybe mom can't do everything you ask right now: that's a huge leap of understanding! Let it go. That's the take-home message of today. (An especially apt message since the movie the rest of Remy's class is watching is Frozen.) I'm gonna lay on the couch and continue getting better. And then when I'm better, we can see what adventures lay ahead of us. But for now, tea and a book.